I haven't posted here for a while. It's simply become a habit not to. But I need to vent for a minute, and while this probably isn't the best way to encourage readers to stick with me (especially since I've been gone for what seems like forever)...I need to get this off my chest. November was when I last posted. It seems like years ago right now. If you've read this blog from its beginning (or read all of my ever-so-many posts), you remember that my husband was gone (I didn't mention it outright in every post, but it was mentioned at least once or twice in passing. He was on a business trip for 3 months. Well, he's on a business trip again, but this time I'll be on one while he's gone too. He left before me, last week. It's funny, knowing that I'll be leaving too, because it doesn't matter how much I know that I'll be gone too. It doesn't matter how much my head knows something, because it still feels like it did on the last long business trip. Except for one glaring difference so far, which I'm not sure if it's because I know I'm leaving too or what...I haven't cried since he left. Don't get me wrong - I was a miserable wreck for the five or so days before he left (when we found out the exact date). I mean that in every sense of the term - we got the exact date, I started crying for no particular reason. We'd be talking about something random and then WHAM, the tears were there. He was wonderful about it, though, and would just sit there and hold me the whole time, trying to make me feel better. The morning he left, well, every time I looked at him I'd break down sobbing. He'd make me laugh as tears were rolling down my face. I'd talk to a friend whose husband was going on the trip too and with no warning, I'd just start bawling. But as soon as he left and I can't see him or touch him (because Skype/Google Video Chat is AMAZING), nothing. Last time, it was the one week mark that did it for me. One week in and I had what I referred to as my "breakdown day" because I just lost it. I'd woken up from a dream that he was with me, holding me, and then he wasn't there and that was it. I lost it and spent most of the day moping. But this time...I haven't cried. And it bugs me enough that I just started a sentence with and, which I know is grammatically incorrect and should bug me. I want to cry but I can't, and because I can't I get upset because I want to, and it's this whole nasty cycle. I've watched romantic movie after romantic movie to no avail. My eyes might water up but then it all just gets sucked into my eye as if my eye is a desert. I even tried what I thought would be my secret weapon - this video. And nothing. I kind of feel all the time like I should cry, like I know that it would make me feel better and less mopey, but I don't. And I don't know why I'm confiding in you, whomever you may be, but since I've been watching too many girly movies, this quote popped into my head as being perfect for this spot. It's from "You've Got Mail" which is definitely high on my list of awesome girly movies for when I'm sad. So much of what I see reminds me of something I read in a book, when shouldn't it be the other way around? I don't really want an answer. I just want to send this cosmic question out into the void. So good night, dear void. And now, since I've probably thoroughly depressed all of you, I thought I'd at least share something sewing-related. Well, I was going to share some stuff from my flickr stream but am getting an error because of the password on my flickr. And since I'm not about to lose everything I've written...hmm. Well, for one, I have kept my finishes and my WIPs up to date-ish. Except that the number of quilts I now need to make is up to 9, just for the babies. That's right - NINE baby quilts from now until March. And I'll be on a business trip (read: no sewing machine or fabric!) for at least a chunk of that! I choose to blame the pile-up of quilts on one coworker, whose wife is pregnant with triplets. One-third of my quilts are for his family, haha, not that he knows it! And so, since this photo is on my hard drive, the recipient of this quilt just recently sent me a picture of it. I made this by hand when I was in college for a friend whose wedding I missed, then whose son's birth I missed. So I made them this quilt (drafted on my trusty graph paper!) by hand, piece by piece, in college, quilted it by hand, and for the first time, used a sewing machine to attach the binding to the front of the quilt and then sewed the back by hand. She sent me a picture of the quilt on her couch not too long ago so I could share it on the blog as it's a better picture than I had on my own. This friend of mine also happens to be an author who has a book that will be free 27-28 April on Amazon for your kindle, so check it out! Her blog, with info about the promotion, is here, so go check it out! And without further ado, the picture. I probably love it more than I should, but I still love everything about that quilt. 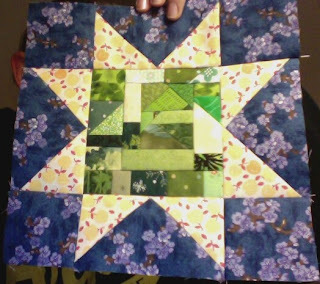 The design came from a website I'd found (this was back probably 7 or 8 years ago, so I have no idea where) and I simplified it so that it would work in a quilt. I added the border myself (original didn't have one) because it needed SOMETHING to enclose it. 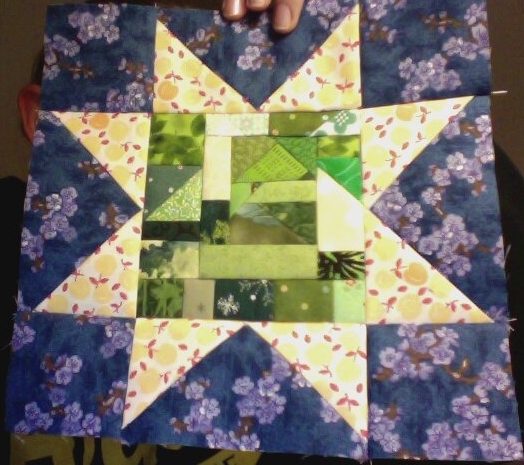 The backing is muslin, and the quilting is echo quilting in matching thread. As in, one line of quilting inside of each shape about 1/4" from the edge, and also one line of quilting outside of each shape in a nice harvest gold shade of quilting thread. I'm glad to see it's still holding up well, since it was not very densely quilted and it was pieced by hand! Let's hope it lasts as long as some of the old antique hand-pieced quilts! With that, dear readers (if there are any of you out there), I'm going to say thank you. I feel much better after venting, so hopefully there will be no more angsty posts, and more posts in general. They won't all necessarily be about quilting itself since I'm not going to have a machine, but I should at least hopefully be able to catch us up with the quilts I've finished and haven't blogged about yet. So this begs the question - what are YOU up to quilting-wise, or anything else-wise?